← Pizza Soup – It’s for Dinner! Hersey prefers to call these Double Chip Brownies but as I baked them with the express purpose of bribing my dad into babysitting our 3 kids this past Friday while we went out for a date night I thought Triple Chocolate Bribe was a much more appropriate title. Between the two types of chocolate chips I used plus the cocoa powder I figured this had to be a triple threat. My dad is the original chocoholic and it really is the more chocolate the better with him. So I spend sometime going through my large tome entitled the Hershey’s Recipe Collection. After all if you are going to bake chocolate you should probably go with the folks for whom chocolate isn’t just a hobby it’s a business. I had gotten this big book of recipes from a good friend of mine. He found the book in a truck stop and decided to bring a bunch back with him on one of his trips. I’ve flipped through it more than once and at some point I’ll try to make everything in it. Probably because my dad will be called on to sit many times in the future. When I made these I went with 1 cup of semi-sweet and 1 cup of dark chocolate chips in lieu of the milk chocolate and peanut butter chips. My dad is a bitter chocolate fan. The darker the chocolate, the stronger flavour, the better it is in his opinion. I lined my pan with parchment to ease in removing the brownies from the pan when they were cooled as per instructions. I’m becoming such a huge fan of this prep step of giving myself parchment handles. It only take a minute and removing stuff from my pans has just never been easier. I did, of course, have to sample my work and I was blown away by how fudgy these brownies turned out. I am a huge fan of brownies that are crisp on the outside but then are chewy on the inside. Like eating a piece of creamy fudge. These didn’t disappoint. They were just the way I adore brownies to be. 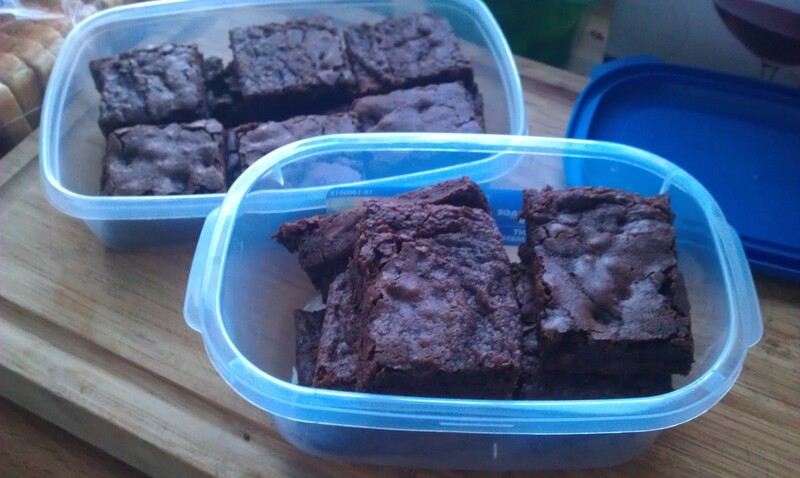 My containers of cut brownies waiting for lids to be able to go with their very happy recipient…my dad! Close up of the Triple Chocolate Bribe. You can see the two different chips I went with. 1) Heat oven to 350F. Grease 13x9x2 – inch baking pan. 2) Stir together cocoa and baking soda in large bowl; stir in 1/3 cup melted butter. Add boiling water; stil until mixture thickens. Stir in sugar, eggs, and remaining 1/3 cup melted butter; stir until smooth. Add flour, vanilla, and salt; blend thoroughly. Stir in milk chocolate chips and peanut butter chips. Spread in prepared pan. 3) Bake 35 – 45 minutes or until brownies begin to pull away from sides of pan. Cool completely in pan on wire rack. Cut into square. 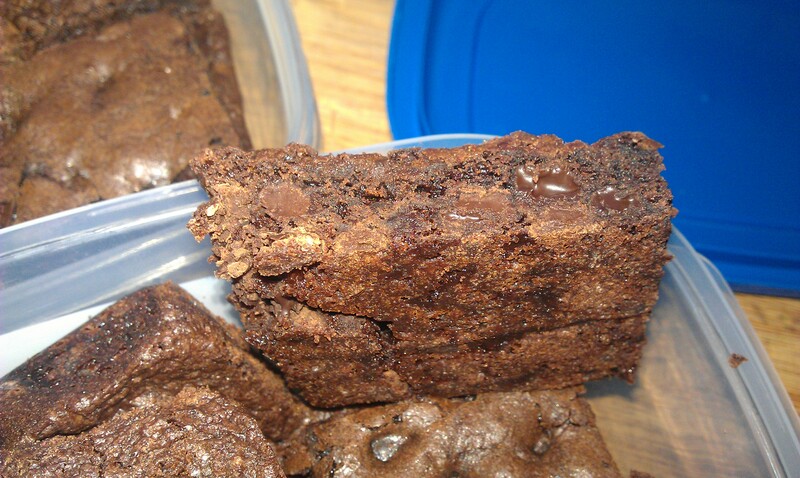 Posted on January 30, 2013 by Shirley Robert	• This entry was posted in Recipes and tagged bitter chocolate, brownies, chocolate chips, dark, food, Hershey's, semi-sweet, triple chocolate. Bookmark the permalink.